Photo of the day: HAPPY 88th BIRTHDAY URSULA VON RITTERN ! 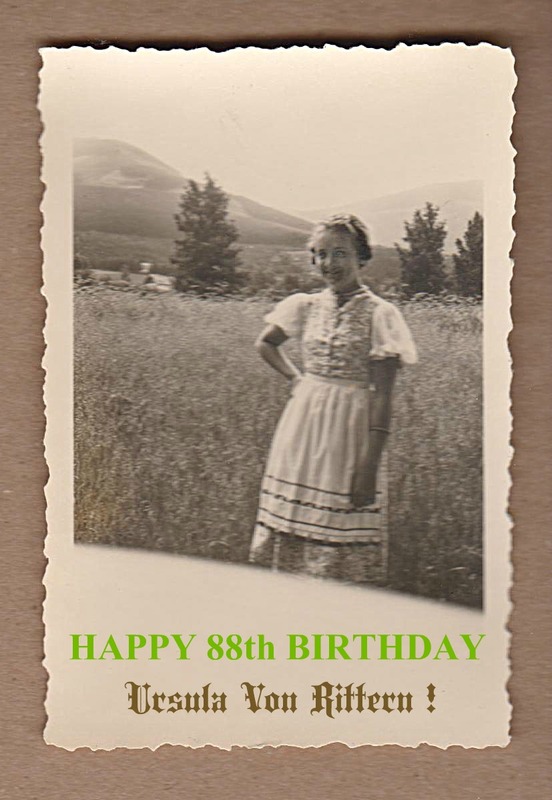 Photo of the day: HAPPY 88th BIRTHDAY URSULA VON RITTERN – This is almost a scene from “The Sound of Music”, the photo was taken about the same time the famous von Trapp family was roaming in those hills as well singing their hearts out. This photo was taken approximately in 1938, mom is about 12 or 13 years old here wearing her traditional German dirndl dress. With not a care in the world picnicking in the mountains not knowing what horrors she was about to experience in Germany. Her teen years were spent in World War II, the stories are gruesome yet fascinating. We are in the process of writing our family history and her life story now. Ursula finally immigrated to the United States in 1952, I arrived three years later in 1955, and so the story continues. Herzlichen Glückwunsch zum Geburtstag and Happy Birthday mom!